I once donated a new pair of sports shoes to Goodwill. Two other pairs of shoes I flat-out threw away. There are many interesting books you come across while reading about knee pain or exercise. 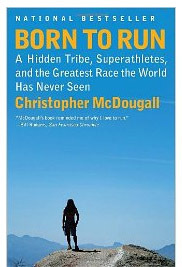 One book which bridges this gap while also being very well written is Born to Run by Christopher McDougall. This book is about McDougall’s own quest to fixing his running-related injuries and the original people he meets on this journey. “Born to Run” caught me slightly off guard I have to admit, because I expected the book to be more science-y and although it’s non-fiction, strictly speaking, it still reads like a novel. A novel you can’t put down until you’re through. Even if you’re not into jogging I highly recommend this book, because it’s not only entertaining, but also educating the reader. How does all that tie in with this post’s topic you might ask?